Independently Owned & Operated in VA Since 1935! At Wright’s Used Auto Parts and Salvage we understand that one of the most important parts of our company is the staff that cares for and represents our auto parts products, services and most importantly…. Our customers! We employ only the best and most experienced auto professionals in their respected jobs whether it be delivery drivers, parts dismantlers or sales representatives. Our auto parts recycling team is here to serve your auto parts needs! Our auto parts sales office and recycling yard are conveniently located in the heart of Charlottesville Virginia just off of Interstate 64. With over 10 acres of quality parts vehicles, storage warehouses and recycling facilities we are able to meet the parts needs of local buyers as well as parts customers from all over VA and the US. Call today and find the "Wright" part for your vehicle repairs! Searching for the best prices on used auto parts in VA? Want to protect your auto parts purchase beyond our standard protection plan by buying an extended parts warranty? Wright’s Used Auto Parts and Salvage offers some of the best and most competitive prices on used auto parts locally in Virginia as well as the East Coast Region and nationally. Call our expert sales staff today for the best parts prices and extended warranty details. Local Wrecked, Salvage & Junk Car Buyers in the Charlottesville VA Area... We Also Sell Cars! Harry A. Wright’s Used Auto Parts & Salvage is a full service auto salvage yard located in Charlottesville, VA. Wright’s Used Auto Parts locally serves VA, parts of NC, MD and WV as well as the entire US via nationwide shipping including: Charlottesville, Richmond, Fredericksburg, Staunton, Harrisonburg, Lynchburg, Roanoke, Lexington, Petersburg and other local areas. Wright’s specializes in and stocks thousands of late model used parts for cars, trucks, vans and SUVs both foreign and domestic including: Low mileage Engines, Transmissions, Axles, Rear Ends, Starters, Alternators, A/C Compressors, Radiators, Wheels, Used Tires, Auto Body Parts including: Front Ends, Hoods, Fenders, Grilles, Front Bumpers, Headlights, Doors, Taillights, Rear Bumpers, Deck Lids as well as well as Interior Parts. Wright’s is one of the oldest salvage yards and used auto parts providers in VA and the entire east coast. 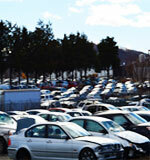 Tour Our Auto Salvage & Recycling Yard Virginia!